We are a manufacturer of domed skylights made of acrylic glass. Our modern daylight systems are famous for their versatility in thousands of applications. We offer domed skylights made of plexiglass (PMMA) and domed skylights made of polycarbonate (PC). The products are available in a wide variety of forms (rectangular, round, oval, pyramid-shaped, triangular, etc.). You can also get custom designs if needed. BÖRNER offers a large range of additional products like smoke and heat extraction (SHE), ventilation flaps, dark flaps and skylight upstandsmade up of fiberglass reinforced polyester resin, highly insulated passive house skylights, and flaps, to name but a few. We stand for modern roof domes that are continuously enhanced. Individual accessories are available on request. Our opal or colorless acrylic glasses can be used to influence the lighting atmosphere or the incidence of light. For outstanding thermal insulation use our highly innovative Nauheimer Passivhouse Skylights. 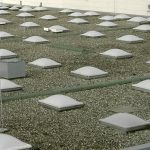 These domed skylights were invented in collaboration with the Passive House Institute (PHI) and are the right choice for all architects that want to save energy – not only in passive houses. The Nauheimer Passivhouse Skylights meet the standards for passive houses and are certified by the PHI. BÖRNER is your first choice when it comes to the construction of the perfect domed skylight. Our roof domes are robust and long resisting.